Whilst Milton has the ever popular Pilgrims, The Coffee Guild, The Sourdough bakery and Brown Sugar cafe among others that are also very popular. Plus Milton now has a Devonshire Tea House. Scroll down for the write ups and reviews / customer feedback received on each. Lunch: A ‘Garden wrap‘ with Mushies, corn, baby spinach, carrot, cucumber, red cabbage and much more. ‘Energy bowl‘ with brown rice, almonds, beetroot, pomegranate, currants, baby spinach, and much more. ‘Kaleidoscope salad‘ with cayenne sweet potato, red cabbage, corn, cucumber, beetroot, hommus, paprika and more. 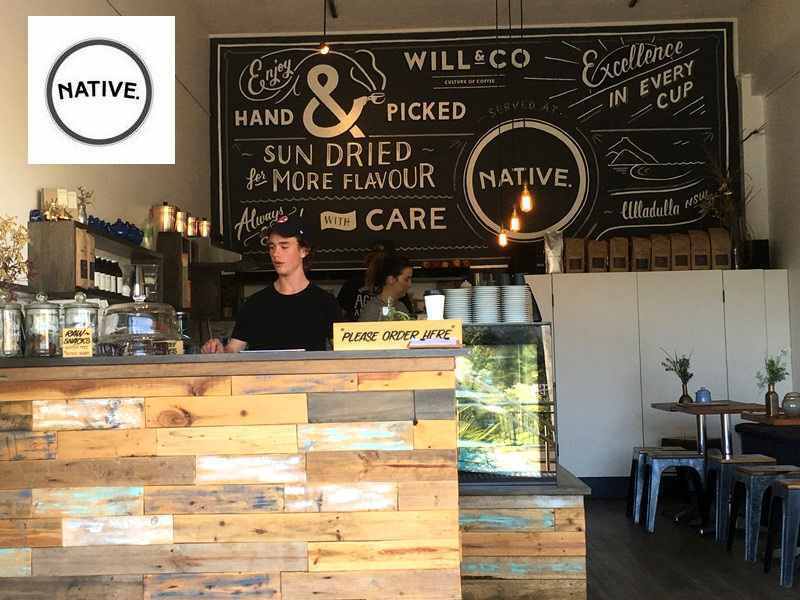 Refreshments: Will & Co. coffee, a variety of teas, smoothies, organic coconut water, kombucha and a variety of juices. 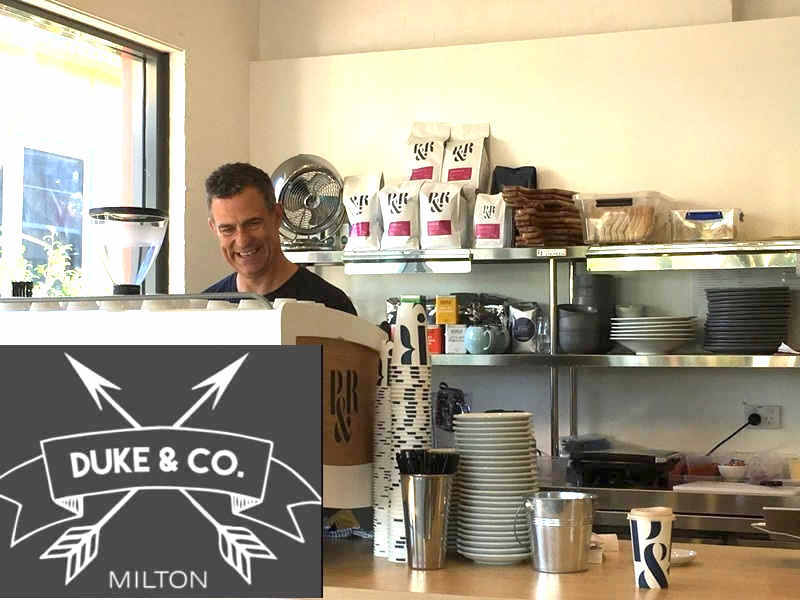 The ‘Milton Coffee Hub’ – Duke & Co. 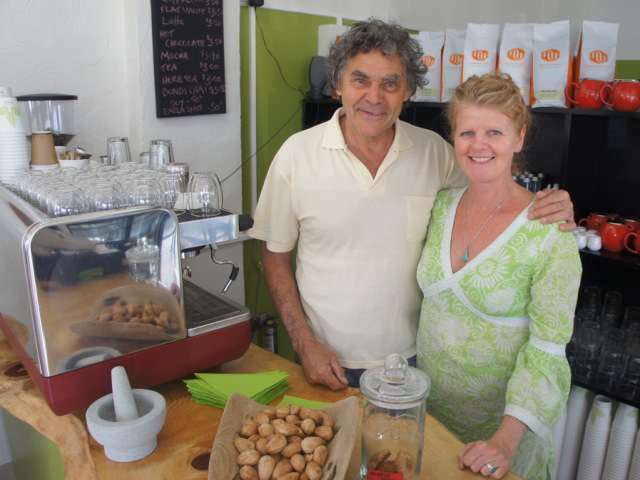 Hosts: David and Rebecca Wilson provide Pablo & Rusty’s Specialty coffee complimented with a fabulous breakfast and Lunch menu made from fresh local organic produce sourced from Claydon Park, Milton. Open Daily: 6.00 am to 3.00 pm Monday to Friday & 7.00 am to 3.00 pm Saturday & Sunday. 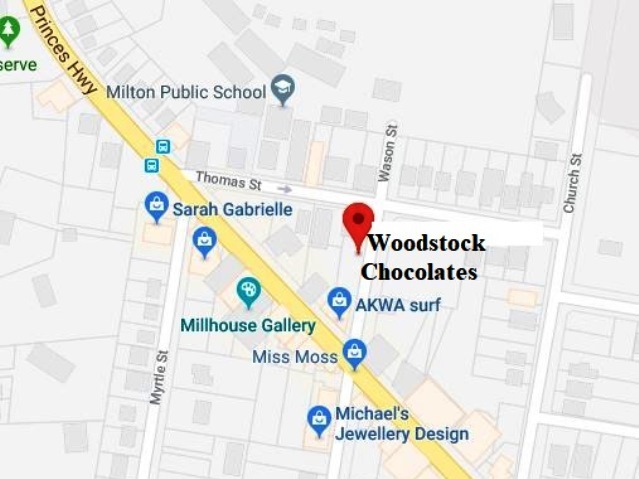 Established in Woodstock NSW, on the outskirts of the picturesque South Coast village of Milton, the Woodstock Chocolate Co. is an artisan chocolate maker creating handmade chocolate delights for locals, visitors, gift-givers, chocolate aficionados, events and businesses. The Woodstock Chocolate Co. uses only the highest grade Belgian chocolate and combines this with the finest ingredients, sourced wherever possible from local suppliers as well as our very own home grown produce. Details: Shop 6 / 23 Wason Street, Milton NSW. 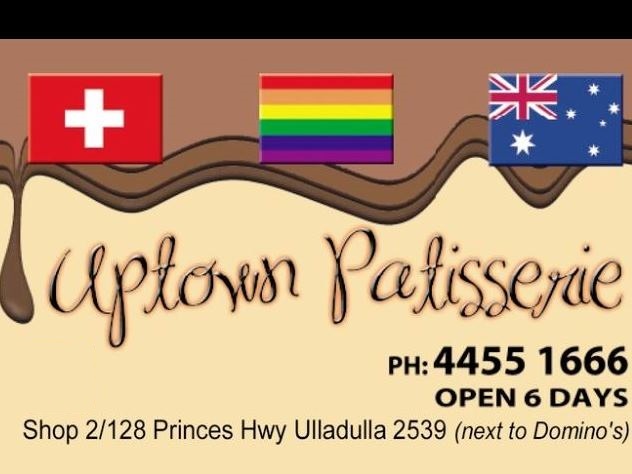 phone: 0458 652 280 or Facebook: Woodstock Chocolate Co. The Brown Sugar Cafe at Milton serves excellent coffee, ranked by some as the best in Milton, others place it “line ball” with Pilgrims and the Coffee Guild. Opening early morning for breakfast, it has build up an excellent ‘eating out’ client base. 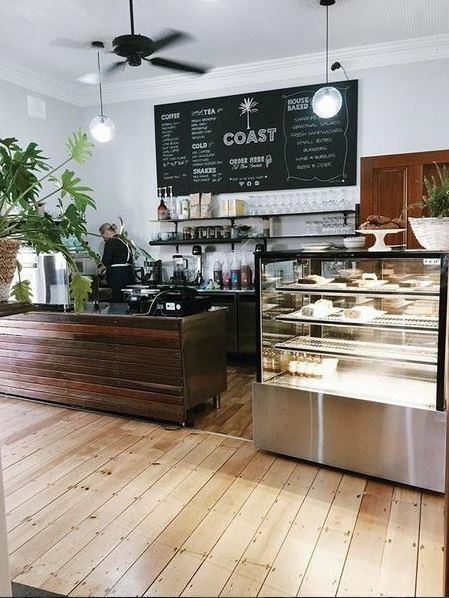 Besides serving great coffee inside or alfresco outside they also offer a variety of accompaniments, good friendly service and take away coffee. 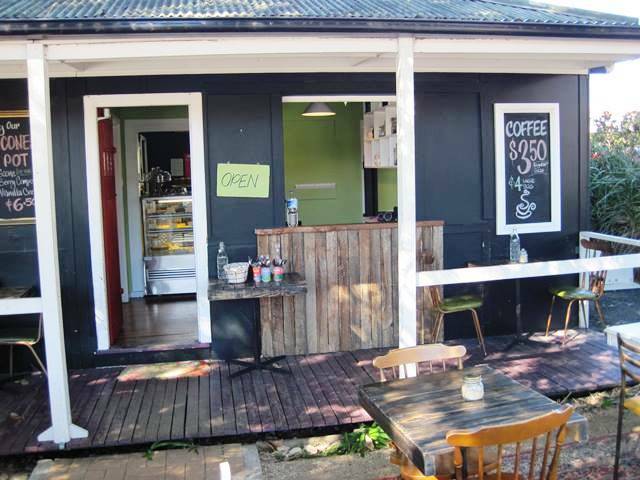 The ‘Brown Sugar’ cafe is located on the highway in the centre of town. 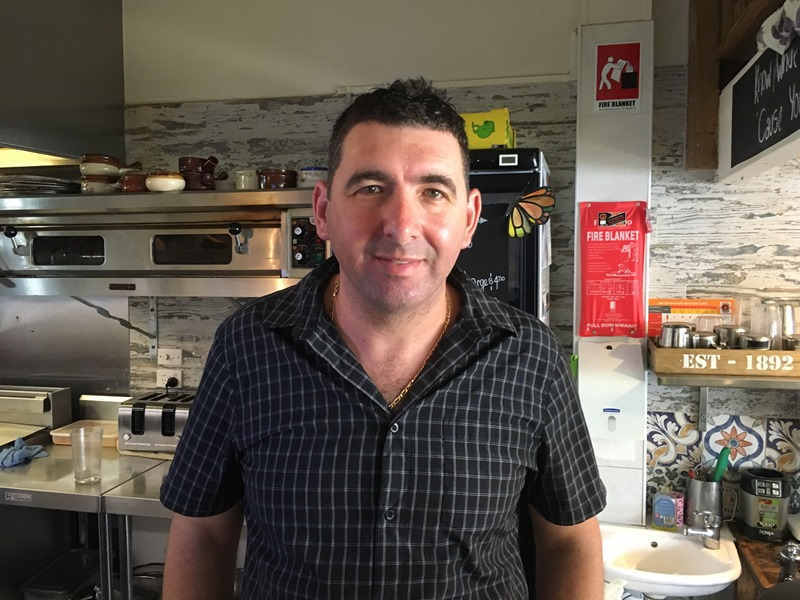 Phone: Mark – (02) 4454 0887 Open: Monday to Friday 6.30 am to 3.00 pm and Saturday 7.30 am to 2.30 pm. Closed Sunday. 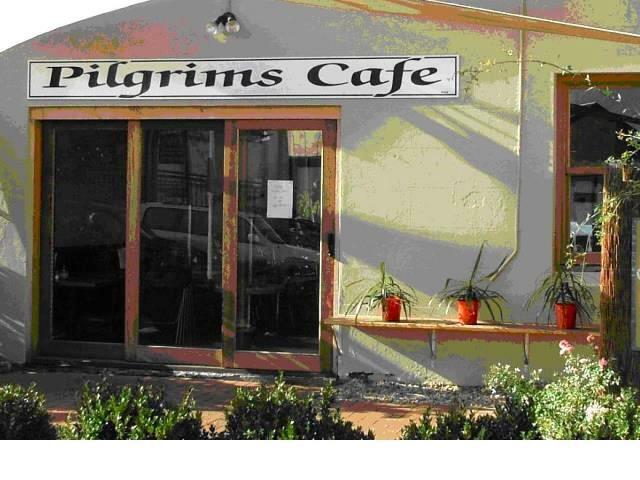 Pilgrims Cafe Milton is highly regarded in the Mollymook Ulladulla area for its healthy vegetarian foods, so tasty & appealing. Choose from awesome salads, burgers, rolls and pies. Friday and Saturday nights they provide a variety of Mexican dishes. Open: Daily from 9.00 am for Breakfast / coffee / Lunch and Friday & Saturday nights for Dinner. 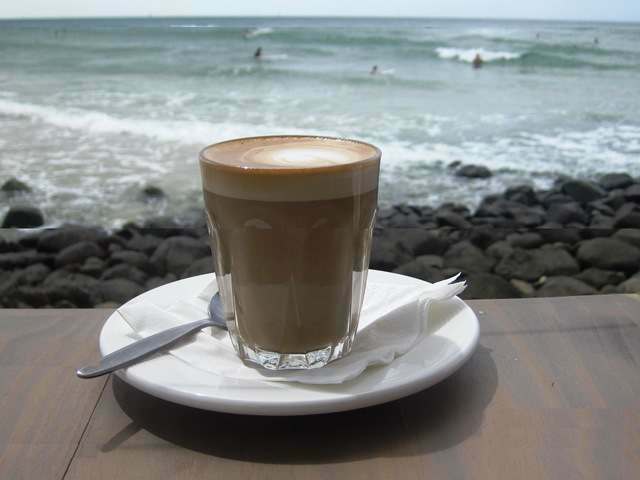 Wholesome food, lunch, light snacks, cakes and fabulous coffee. As the name says, our bread only contains three ingredients – organic flour, purified water and sea salt. Our organic bread is authentic sourdough as we use a natural leaven. We don’t add baker’s yeast, or anything else you wouldn’t expect – we believe good bread should be made using the purest of ingredients. We keep it traditional – our artisan bakers cut no corners when it comes to their method: Shaped and moulded by hand, our breads are left to rise for hours in willow baskets and baked to produce authentic European handcrafted sourdough. 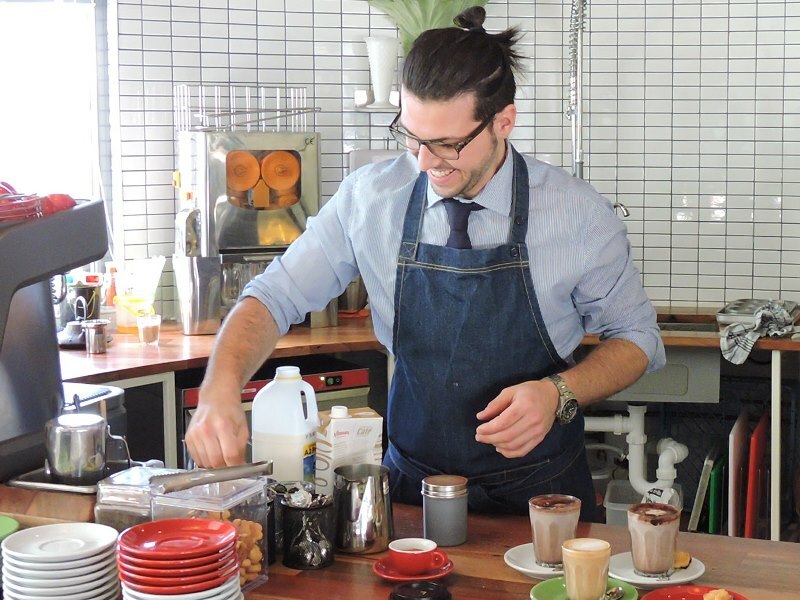 We believe in using the best ingredients available to us – no shortcuts. We source products from suppliers that are like minded and respect their product and take pride in what they are doing. Where we can, we use local ingredients, and sometimes we are even lucky enough to be given home grown produce from customers, whether that be a laden apple tree or herb garden. We respect the seasons and what the farmer has in abundance, we turn into delicious jams and preserves. A nicer setting would be hard to find. 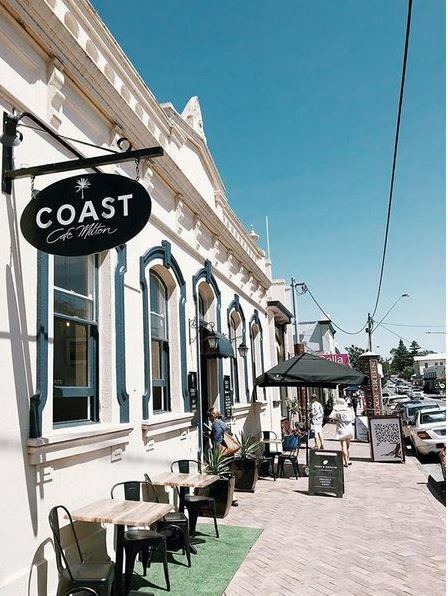 At Coast Cafe Milton NSW you can dine indoors or outdoors in the ‘alfresco garden courtyard’ with views of the Budawang mountains. Perfect for breakfast, a delightful lunch or simply just calling in for coffee with friends. 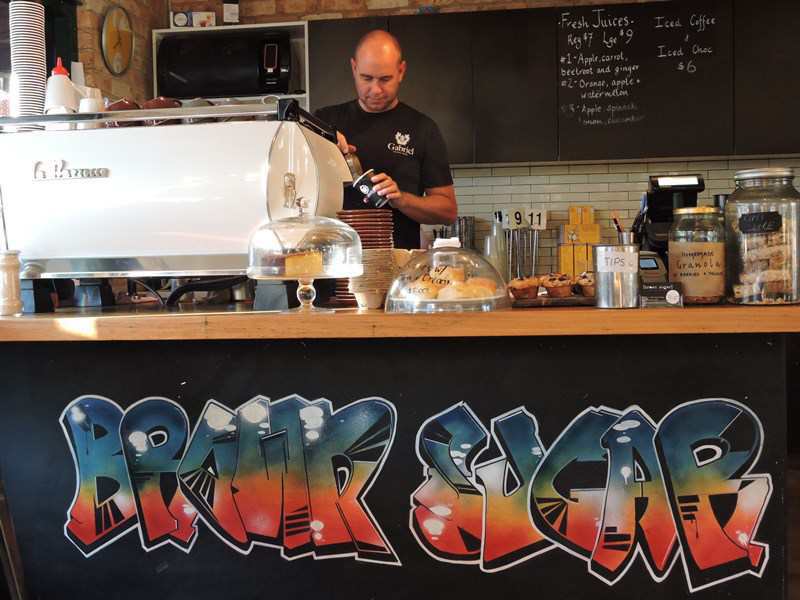 The the cafe offers a modern menu featuring breakfast, gourmet salads, burgers and sandwiches at affordable prices. Opening Hours: 8.30 am to 4.30 pm seven days a week & 5.30 pm > Friday and Saturday nights. 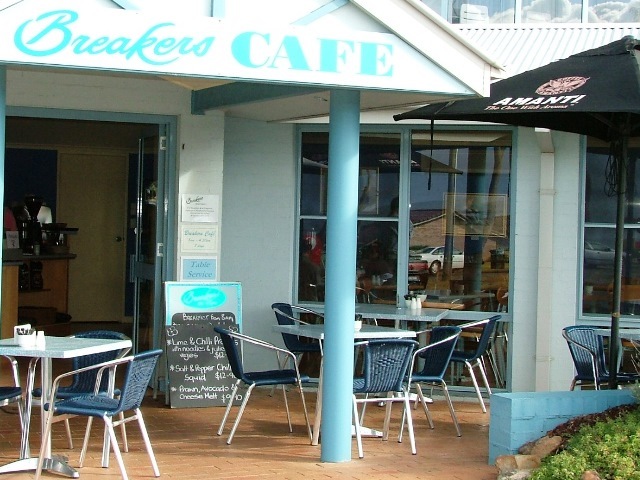 Breakers Café located on Ocean Street just up from the beach provides quality food and service for breakfast and lunch with a traditional café style menu. Plus during the summer months they offer an excellent dinner menu on a Friday and Saturday night. Highly recommended, freshly baked home-made muffins, scones and cakes available throughout the day for those who just want a snack & coffee. Daily – 8.00 am to 3.00 pm & on a Friday and Saturday evening. Highway entrance in the historic Chambers Shopping Complex at Milton NSW. 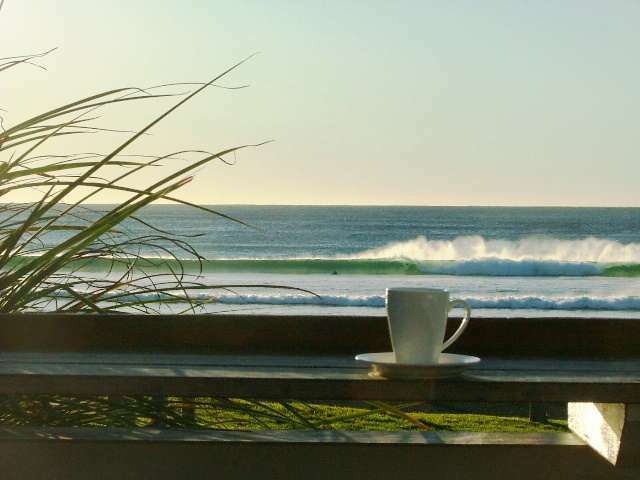 Breakfast, lunch and coffee daily with dinner available on a Friday and Saturday evening. Choice of dining inside and/or outside with rural and ocean views plus a beautiful sunny aspect. 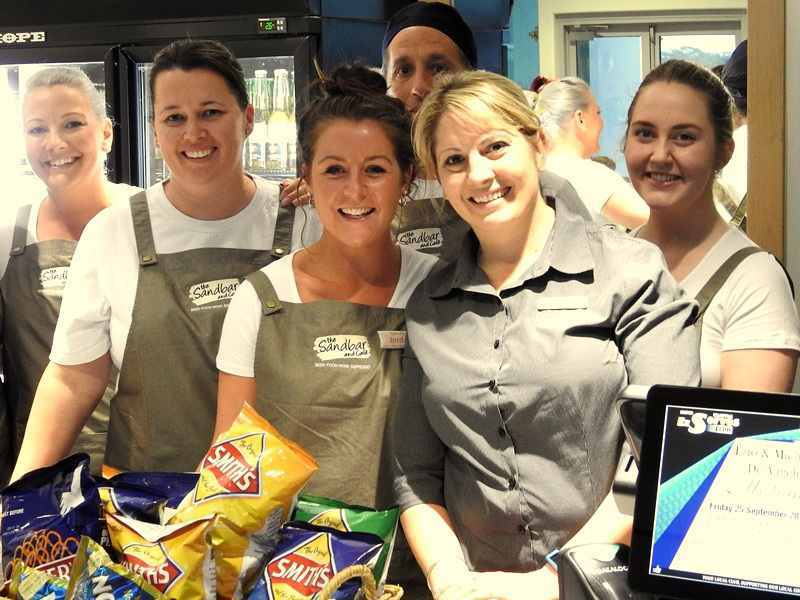 Location: Boasting panoramic views of Ulladulla Harbour, the Ex-Servo’s Club operate the Cafe in partnership with Stewarts Catering to ensure the finest food and excellent service is the hallmark of this exciting business venture. Experienced Chefs use fresh and sustainable ingredients sourced from the best local suppliers with a menu that caters for all occasions and dietary requirements. Hours: Daily from 7.00 am – Breakfast is served from 7.00 am – 10.30 am. Lunch 12.00 noon to 2.30 pm. 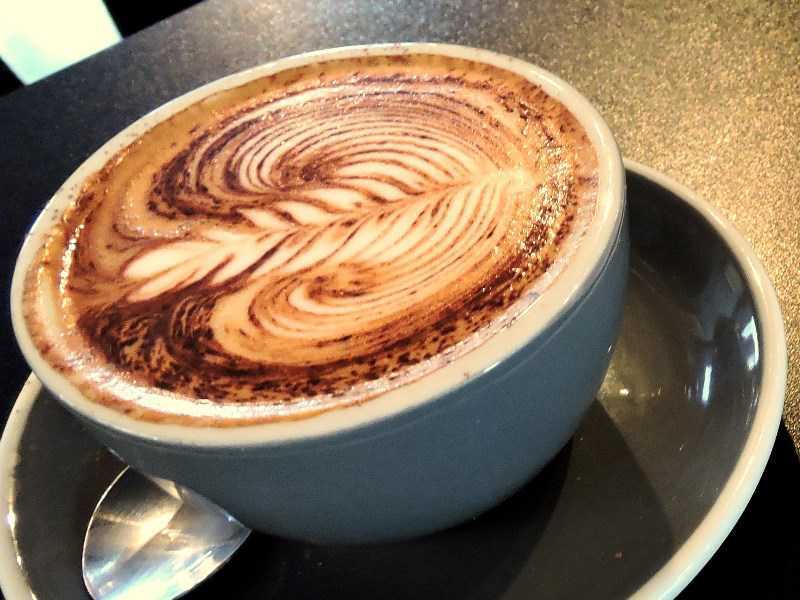 Great coffee accompanied by a large choice of patisseries.